When Harold Reeve moved to Stanislaus County in the early 1980s, he thought it would be fun to develop an official Stanislaus County bird list. Back then, local birding was in its infancy and county birding, which requires birders to keep a list of birds they see in each county they visit, was practiced by only a handful of birders. Today, the official Stanislaus County bird list comprises 319 species, and Reeve has seen over 300 of those species himself. He’s also kept over thirty years of meticulous records of the birds he sees when he manages to free himself from the duties of family, job, and church. As the years have accumulated, it’s become harder and harder to add new birds to the list. Birders like to add spice to their game by predicting which new birds they will see next, and Reeve has always kept a mental list of birds most likely to show up in Stanislaus County. He’s also kept a short “wish list” of birds he’d really like to see that are highly unlikely to appear in Stanislaus County, either because they’re rare statewide or because they would be too far out of range and habitat to be expected. One of the most tantalizing birds on Reeve’s wish list was the Black-headed Gull. It was tantalizing because a Black-headed Gull appeared several years in a row in San Joaquin County in the late 1970s and early 1980s. Those appearances were the only records ever recorded anywhere in the Central Valley. 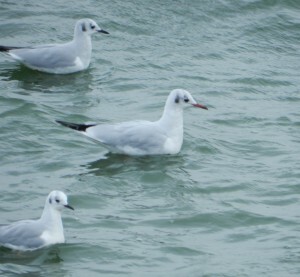 Of the twenty-plus California records of Black-headed Gull, almost all have occurred along the coast. The Stockton records were one of the inexplicable anomalies that make birding so exciting—because they fly, birds can show up almost anywhere. Sunday, Reeve was doing his bi-monthly census of birds in a restricted-access location where he’s found a number of new species over the years. When he saw of large flock of Bonaparte’s Gulls, he decided for no particular reason to take a picture of the group with his digital camera. 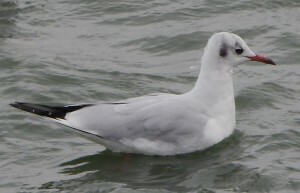 Bonaparte’s Gulls are increasingly more common in Stanislaus County, and can be expected in large numbers in fall and winter. Again, for no particular reason, Reeve immediately pulled the picture up on the camera screen for review. Imagine his shock when, in the center of the frame, he saw a Black-headed Gull. Very similar to Bonaparte’s Gulls, the Black-headed Gull is slightly larger, paler on the mantle, and has a larger bill with a red base. With two birder friends, Reeve frantically scanned the flock of Bonaparte’s Gulls, which contained well over a hundred birds. Within a few minutes they had found the Black-headed Gull and reviewed the crucial field marks which distinguish it from Bonaparte’s Gulls and the very similar Franklin’s Gull. There then followed a flurry of photos, because when a bird as rare as a Black-headed Gull appears in California, it helps to have proof—birders are a friendly but skeptical group. Almost certainly from Siberia, Stanislaus County’s and California’s latest Black-headed Gull is only the fifth appearance of this species in the state since 2004. Overall, it is the twenty-seventh state record and number 319 for Stanislaus County. For Harold Reeve, it is literally a wish come true, and a reminder that nature always has a surprise in store for those who learn to appreciate its infinite variety.